The World's Only Online Snowman Magazine: Winter is officially here - roll in the Giant Snowmen! Winter is officially here - roll in the Giant Snowmen! London, Ontario is the home of the latest giant snowmen. 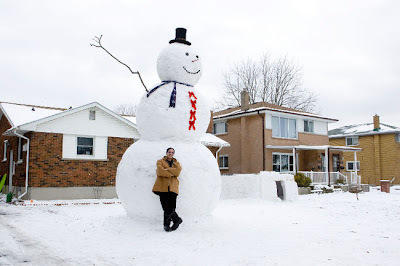 Bob Mann and his the 20 foot high snowman he built in the front yard of his London, Ontario home on Tuesday, January 1, 2013. The snowman is now the talk of the town and has become a star on Facebook. 'It took quite a bit of engineering to get it right. I kind of 'cheated' by building boxes for each layer and filling them with snow. 'The actual snow came from everywhere - my garden, the neighbours' garden and a bank across the street. The team worked until Sunday night when the snowman's top hat was lowered into place. In other Snowman News - Today' Snowman has a History of the Snowman Pinterest Board - come take a look at what were are pinning.